Download Deep Blue Sea 2 in Digital HD from the iTunes store. Deep Blue Sea 2 images are © Warner Bros.. All Rights Reserved. In 1975 we became terrified of the water when Steven Spielberg's (E.T. : The Extraterrestrial) Jaws hit movie theaters. Let's face it… who can forget that huge mouth with all those teeth coming out of the water as the now iconic John Williams' score played in the background. Then in 1999 we were once again reminded why it wasn't safe to go into the water when Renny Harkin (Die Hard 2) gave us Deep Blue Sea. After the film's moderate success there was talk of making a sequel which never came to fruition until this month with the straight to video Deep Blue Sea 2. Misty Calhoun (Danielle Savre; Boogeyman 2) has grown up in the water and now works to carry on her mother's legacy. When she is suddenly invited to consult on a secret project she is skeptical but decides to consider it as she is offered a large amount of grant money in return - money she can desperately use for additional research. However when she arrives, along with other scientists at the deep sea research facility she is immediately concerned with what she sees. Pharmaceutical Billionaire Carl Durant (Michael Beach; Lean on Me) is funding this research but his methods and motives seem questionable at best. Besides extracting shark antibodies in order to help cure disease he has also altered a group of highly unpredictable bull sharks and bioengineered them to obey commands, or so he thinks. However, when these sharks begin to become out of control the scientists are unprepared for how easily they have adapted. They not only "break free" from their holding pen but attack humans in an aggressive manner trapping them on the remote facility. The team must figure out a way to stop the sharks and signal a rescue mission before the sharks devour them. There is a reason the sequel to the original film was never made and also a reason why this one went straight to video. The film is only 72 minutes long but even that seems too long. The plot is so far fetched it is almost laughable and the script is groan-worthy…often. I wish I could say the cast faired much better but Savre seems little wooden in her performance and the other scientists aren't much better. Kim Syster (Capetown) and Jeremy Boado (Striving for Freedom) who play newlyweds Daniel and Leslie Kim are awkward making their scenes uncomfortable to watch. Beach is decent but would probably be very good with better source material. Deep Blue Sea 2 is showcased in a 1080p, AVC-encoded presentation. Colors are very saturated and for obvious reasons lean towards the color blue. Details are sharp and while this disc is not "demo quality" it still provides a very decent picture for a "direct to video" sequel. The audio is presented in DTS-HD MA 5.1 and is heavily front-loaded on the center channel while the rear channels are relegated to the soundtrack and very few sound effects. 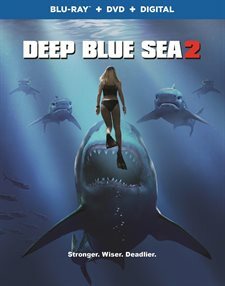 Aside from the now common Digital HD copy of the film, the Blu-ray/DVD combo pack also contains the following features: Returning to the Deep: Making Deep Blue Sea 2 (Only watch after you have seen the film as it gives away some of the plot) Deep Blue Sea 2: Death by Shark, a gag reel, and deleted scenes (four of them). 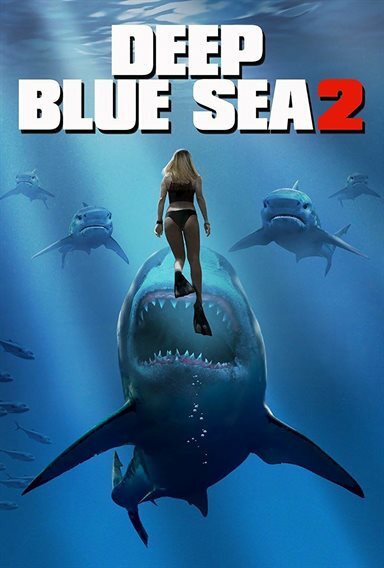 Its a shame after such a long wait that Deep Blue Sea 2 doesn't live up to the original. While it has potential it never seems to get out of its own way and sadly makes for a mediocre offering at best.